Sergey Lavrov reminded that US President Barack Obama said in 2009 in Prague that there would be no more need to create a European segment of the missile shield should a solution be found to Iran's nuclear issue. Iran and P5+1 have ended a years-long marathon on coordinating agreements, Russian Foreign Minister Sergey Lavrov has said. "Years-long marathon negotiations to coordinate agreements between P5+1 and Iran with the coordinating role of the EU high representative has ended," Lavrov said. "Federica Mogherini and Iranian Foreign Minister Javad Zarif will present these results for journalists and the world public," he said. "Let me dwell on most important projects," he continued. "Firstly, a joint comprehensive plan of action consisting of the main document and five technical utterly concrete proposals has been coordinated. A draft resolution of the UN Security Council has been coordinated, which all participants in the talks will submit as co-authors in New York in the next few days, to have it considered by the Security Council and put to the vote. We expect it will be supported unilaterally," he said. According to the minister, a range of sanctions, including the United States’ and European Union’s unilateral measures, will be lifted off Iran immediately. "A range of sanctions is to go immediately, including unilateral sanctions of the European Union. Many sanctions related to restrictions the American imposed on cooperation with Iran in the sphere of civil aviation and many others will be lifted," he said. The Russian top diplomat also noted that the weapons ban on Iran will stay in place for five years but weapons supplies will be possible in this period under a United Nations Security Council resolution. "As for the weapons ban, Russia and China insisted on its lifting among the first restrictions subject to abandonment. 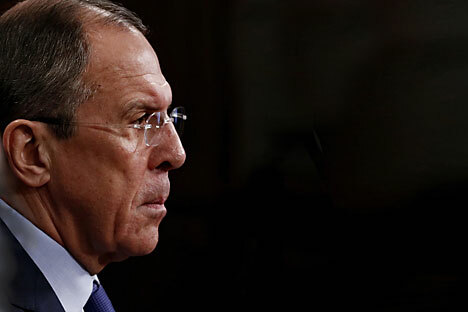 In the long run, the Iranian partners - and they have a decisive say here - have agreed for a compromise, since the West has been insisting on keeping the weapons ban in place for eight to ten years," Lavrov said. "Finally, a compromise has been reached between the Iranians and the Western partners, and Russian and China has supported it, bearing in mind that Iran agreed on that. So, [it will stay] for five years. Over this period, weapons supplies will be possible after corresponding procedures, notification and verification via the United Nations Security Council." Lavrov stressed that Russia expects Washington’s move towards giving up plans on creating the missile defense shield in Europe after the deal on Iran’s nuclear program has been reached. Speaking on the deal in a "broader context," Lavrov reminded that US President Barack Obama said in 2009 in Prague that there would be no more need to create a European segment of the missile shield should a solution be found to Iran's nuclear issue. The diplomat said that Russia will be actively involved in the practical activities to implement the agreements with Iran. "This concerns, in particular, the two issues mentioned in the draft agreements relating to the export of low-enriched uranium to Russia in exchange for deliveries of natural uranium," he said. "This concerns the conversion of the former nuclear processing facility at Fordow to the enterprises producing stable isotopes for medical and industrial purposes." "Of course, the solution that has been found on Iran will play an important role in strengthening the non-proliferation regime as a whole and will favorably affect the general situation in the Middle East, North Africa and the Gulf," Lavrov added. The International Atomic Energy Agency (IAEA) will be wested with serious verification authorities under the nuclear deal between Iran and the P5+1 group of international mediators. "IAEA will enjoy very serious verification functions in what concerns Iran’s fulfilment of its liabilities under its nuclear programme," he said. "And the Russian side will take an active part at all stages of the implementation of this agreement," said Lavrov.